Heaven on a plate. Is that sacrilegious? Tuna steaks were (nearly) affordable recently so I took the plunge and bought two. There’s only two of us so buying more didn’t make sense. Rest assured, the recipe below has quantities that comfortably feeds four, so no need to "double up." 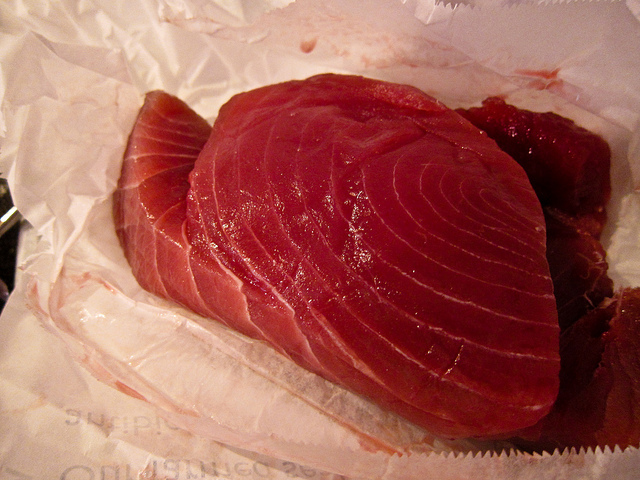 Tuna is called a “nutritionally dense” food. One quarter pound (113 g) has more than 100% of your daily tryptophan, 75% selenium, 68% protein, and above and around 50% of three important B Vitamins. Fresh tuna, like any really fresh fish, tastes like the ocean smells. It’s hard to describe. Any of you who eat sashimi or sushi know what I mean. Almost all the people I know who don’t like fish can trace their distaste to old fish, or fish prepared poorly. It’s not that there’s any real art to cooking fish well. If anything, it’s more of a case of when to stop cooking it. Even the freshest fish can be ruined by being cooked to death. These two recipes unite with the flavour of lemon and actually pair very well. 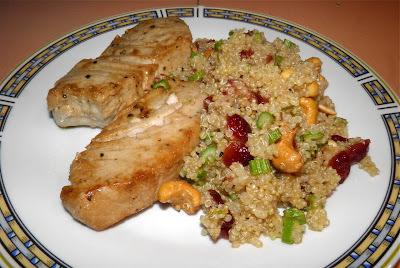 The quinoa is an absolute delight. Fruit, celery, nuts, herbs and lemon (of course) make a combination that will keep returning to this recipe over and over. Actually, it’s one of the best recipes using quinoa I’ve ever eaten. Quinoa is a great substitute for rice or other grains. It isn’t really a grain at all, but a pseudo-cereal seed. It's more closely related to beets than wheat. 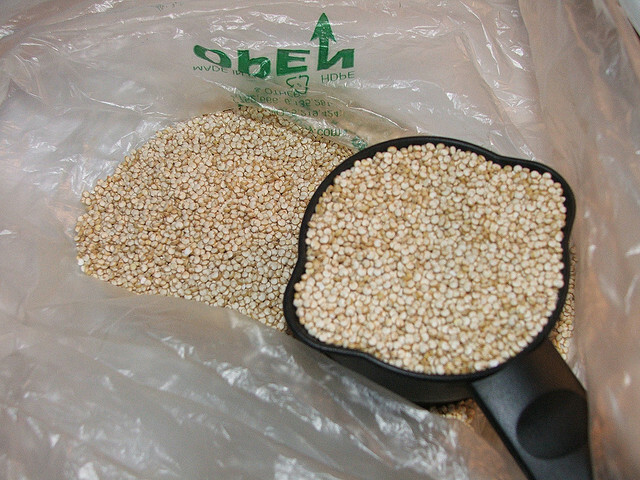 Quinoa has a very high protein content (12%-18%) and was second only to potatoes in importance to pre-Columbian Andean civilizations. Their third most important crop was corn. Both these recipes are easy to cook simultaneously, so you can have dinner on the table in about 1/2 hour. This is tuna for two, not for four... but I suppose it could be. 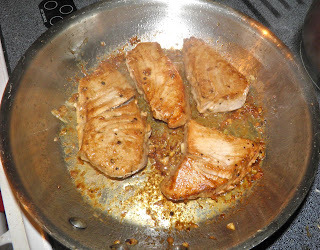 Pan fried tuna steaks can be rare in the middle or cooked through for those afraid of eating raw fish. Combine all the ingredients except for the tuna steaks on a plate. Mix well to combine. Add the steaks and turn to coat well on both sides. Let the steaks marinate on the counter while you make the quinoa. Turn once in the marinade while the quinoa cooks. While the quinoa is steaming off the heat, cook the steaks. Place the tuna in a hot frying pan. Pour the marinade in around them. Cook for 3 to 5 minutes per side. You can tell the rareness of the tuna steaks by the change in colour on the side as they cook. They will still be slightly rare in the centre when the sides are completely opaque. Bring the water to a boil in a saucepan with a well fitting lid. Add the quinoa, salt, cranberries, rosemary and lemon rid. Cover, reduce heat to medium and cook 15 minutes or until all the water is absorbed. In a small container, shake the lemon juice, olive oil and pepper together until well mixed. After the quinoa is cooked remove the lemon slices. Then stir in the dressing, cashew pieces and celery. Cover and let sit for 10 more minutes. Cook the tuna during this time. Fluff the quinoa and serve.